Our modern classic handles collection provides a superior quality, elegant offering for a traditional room setting. Whether in a residential or commercial space, this collection encapsulates striking, no fuss designs in a range of finishes and materials. All of the handles in this range have been developed in-house by Häfele’s team of experts, who are at the forefront of the kitchen and cabinet design sector. The latest suite of products to join the modern classic collection is the Augusta range. 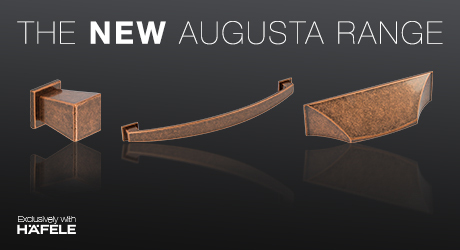 The Augusta handles are built to stand the test of time in both style and quality. Manufactured with only the highest quality materials, each handle has been developed to offer maximum durability, as we as timeless style and design. Available in five different finishes, the Antique Copper finish is a popular trend for 2017, offering a unique industrial finish to add a rustic feel to a room setting. If you are developing a look that requires a sleeker, more polished finish, then the Matt Black or stainless steel options offer a sterile but luxurious touch to statement furniture pieces. The Augusta range offers complete style versatility, depending on your preferred look. The knob, bow handle and cup handle can be fitted with or without the backplates, allowing you to customise and adapt the finish of the furniture with fine detail. Tracy Bird-Hempstock, Senior Product Group Manager at Häfele UK, adds “The cup handle design lends itself to the classic Shaker style, as well as the slab door styles that are so popular at the moment”.